“This is a time for us as a church to be together, regardless of what language we speak,” the presiding priest told the Palm Sunday English Mass-goers at St. Joseph’s in Beijing. I sensed he was gently prodding us to possibly branch out of our comfort zones and attend the liturgies that would be said throughout Holy Week in Chinese. I doubt many put Beijing at the top of their list for sexiest pilgrimages. The first time I was in Beijing for Holy Week I found it difficult to be in a different culture for some of my favorite liturgies of the year. I felt especially exasperated after a three-hour Good Friday service in Mandarin, of which I speak very little of. So I didn’t expect to return, especially not so soon. When I arrived here to study at the Jesuit’s Beijing Center for Chinese Studies two years ago, China taught me what it felt like to be an outsider. Being dropped in the capital of the Middle Kingdom, while knowing so little about its history, culture and language, was exhausting. Even still, China captured my heart. I’m reminded of what Nelson Algren said of Chicago, another city I love: “[It’s] like loving a woman with a broken nose, you may well find lovelier lovelies. But never a lovely so real.” I missed China. And so return to Beijing for Holy Week I did. St. Joseph’s, also known as East Church, is one of the few Catholic churches that exist in Beijing, a city of over 20 million residents. 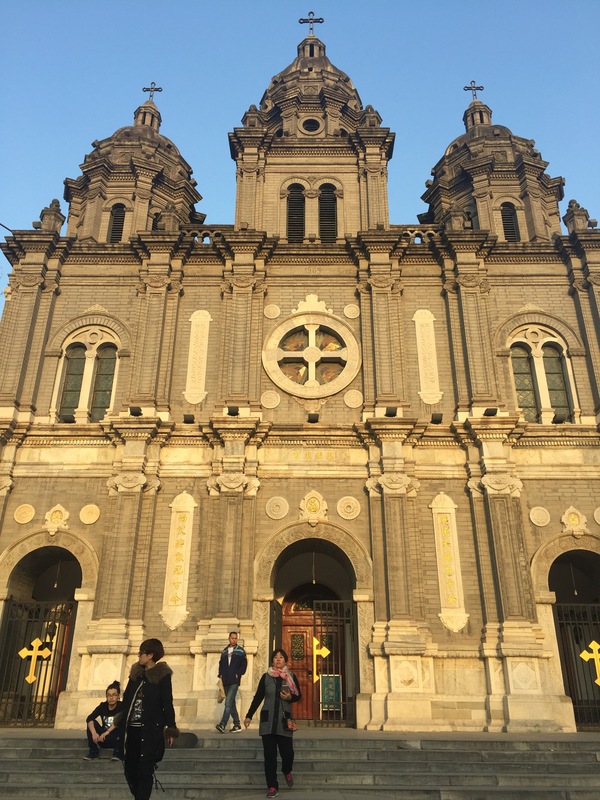 First constructed by Jesuit missionaries in the 17th century, the church has survived destruction, reconstruction, closings and reopenings and now sits on one of Beijing’s premier shopping streets, Wangfujing. In front of the church is a plaza where all sorts of locals, from Skateboarders to line dancers, kill time and occasionally wander through the doors of the Romanesque building that overlooks them. Often the Chinese are described as a people who are largely without faith. Sometimes, this is true. The language around faith can be a stumbling block. Once, while I was studying abroad and living with a Chinese college student, he asked me if I prayed. “Sure, pretty often,” I replied. “But didn’t you pay for the food? With your money?” The idea of thanking God for something that I had worked hard for was for him an anomaly. But I often found that the Chinese were people open to and curious about religion. I have a friend who was born and raised in Beijing, who in addition to visiting numerous Buddhist and Daoist temples, has lived with an American Muslim and visited a few Protestant services in Beijing. On Good Friday, he asked if he could come to church with me. It was easy to get a sense of that Easter morning in Beijing’s South Cathedral. There were three back-to-back Chinese Masses, which had crowds of people outside the church watching from giant TV screens, as there wasn’t any room left inside. While I made it to a Chinese Good Friday service, in truth I opted for the English Mass on Easter morning. Yet, I didn’t really have a problem feeling united to the global church. “Isn’t this amazing?” one of my friends said to me. “People from so many cultures coming together in this city, in this church.” From the Chinese seminarians singing Gregorian chant from the choir loft, to the Filipino charismatic choir singing contemporary worship music during Communion, to the pale-white skinned Virgin Mary shrouded in an LED-lit frame looking down on the Chinese priest presiding over new baptisms, my friend could not have been more right.